Allow asphalt mix to be hauled longer distances. Improve working conditions by reducing exposure to fuel emissions, fumes, and odors. Lower temperatures, lower costs, more opportunities. WMA production methods use temperatures 30 to 120 degrees Fahrenheit lower than traditional hot-mix asphalt. Because less energy is needed to heat the asphalt mix, less fuel is needed to produce WMA. Fuel consumption during WMA manufacturing is typically reduced by 20percent. How does it work? 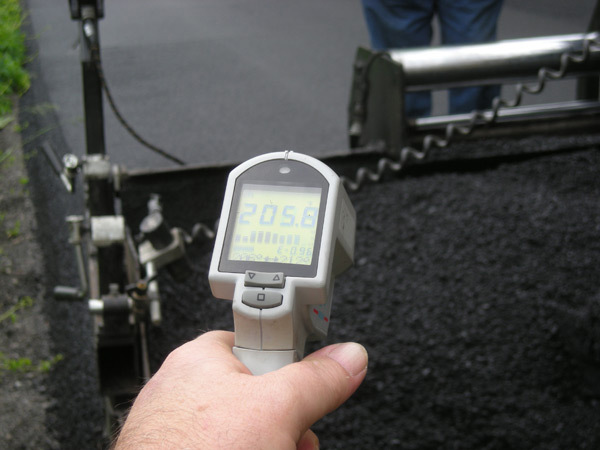 WMA technologies reduce the viscosity (the thickness) of the asphalt binder so that asphalt aggregates can be coated at lower temperatures. The key is the addition of additives (water-based, organic, chemical, or hybrids) to the asphalt mix. The additives allow the asphalt binders and asphalt aggregates to be mixed at the lower temperatures. Reducing the viscosity also makes the mixture easier to manipulate and compact at the lower temperature. Good for workers, good for the environment. Working conditions are much healthier with WMA. Both at the production plant and on the construction site, workers inhale far less smoke and dust. This reduction is particularly important in tunnels, where ventilation is reduced. Comments from workers have been highly positive. According to Brad Neitzke, a Materials Engineer for the Federal Lands Highway, a Division of FHWA, "Certainly, warm-mix improved working conditions at the paving site. The crew's first reaction was to say, "There's no smoke!" WMA also produces fewer emissions, making it possible for paving to be done on some days when the air quality would typically put a halt to paving. A State transportation official recently attested that "On non-attainment days, when the air quality is bad, we often get shut down and are unable to pave. But with warm-mix [asphalt], because the emissions are reduced, we might be able to pave even on days when the air quality is not the best." Internationally recognized. WMA is clearly an important technology for the 21st century. The World of Asphalt's "People, Plants, and Paving Training Program" focused attention to WMA, with multiple sessions at its 2010 conference. At least 14 State Highway Agencies have adopted specifications to accommodate WMA, and more than 40 States have roads paved with WMA. This green technology is increasing the quality of our roads and our environment.